Fisch grew up in East Hanover Township, New Jersey and attended Hanover Park High School. Notably, Fisch did not play football at the high school or college level, but instead was an all-state tennis player during his prep career. Fisch graduated from the University of Florida in 1998 with a degree in criminology. He attended Florida almost solely for the opportunity to someday work for Florida head coach Steve Spurrier. Fisch was also college roommates with Philadelphia Eagles general manager Howie Roseman. Fisch embarked on a career in coaching while still in college as an undergraduate student. From 1997-98, Fisch was the defensive coordinator for P. K. Yonge Developmental Research School in Gainesville, and he then spent one year (1998) with the New Jersey Red Dogs of the Arena Football League as a wide receivers/quality control coach. ^ a b "University of Michigan Official Athletic Site". www.mgoblue.com. Retrieved December 31, 2017. ^ O'Halloran, Ryan. "Inside the game: Entry-level spot with key duties for Jaguars", The Florida Times-Union, November 19, 2013. Accessed December 31, 2014. "Fisch attended Hanover Park High School in East Hanover, N.J., when Sorrentino’s father was the football coach." ^ Gorten, Steve. 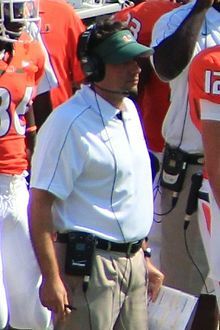 "Jedd Fisch has infused life into Miami Hurricanes offense; First-year offensive coordinator has been key to quarterback Jacory Harris' success", Sun-Sentinel, October 21, 2011. Accessed September 12, 2015. "Fisch never played high school or college football, but has coached for several NFL teams under coaches such as Mike Shanahan, Brian Billick and Pete Carroll. From the time he was an 8-year-old ballboy, he has studied the game. His mentor was a high school coach in his hometown of East Hanover, N.J."
^ a b "Fisch's Journey". July 10, 2010. Retrieved December 31, 2017. ^ "Jacksonville Jaguars: Jedd Fisch". Archived from the original on March 13, 2013. Retrieved December 29, 2017. ^ Associated Press. "Jedd Fisch set to become new offensive coordinator of Jacksonville Jaguars". ESPN.com, January 19, 2013. Accessed May 27, 2013. ^ Jaguars.com "Jaguars part ways with offensive coordinator Jedd Fisch". ^ FoxSports.com "Ex-Jaguars offensive coordinator Fisch to join Harbaugh's staff at Michigan". ^ "New U-M coaches look to bring 'precision,' 'excellence'". Retrieved December 31, 2017. ^ "Jedd Fisch says Michigan's NFL staff experience should give team a recruiting boost". Retrieved December 31, 2017. ^ "Jedd Fisch Named UCLA Offensive Coordinator". UCLA Athletics. January 5, 2017. ^ "UCLA hires Jedd Fisch as offensive coordinator". OC Register. January 5, 2017.